A witness stated, "People were buying things when a man came in with a rifle and started shooting in all directions. I ran out. The shooting continued for several seconds." Coulibaly recorded seven minutes of his attack using a GoPro camera attached his torso, and emailed a copy of the footage using a computer at the supermarket. The video included the deaths of three of the victims. In an interview with BFMTV during an ensuing standoff, Coulibaly stated that he targeted the Jews at the Kosher grocery to defend Muslims, notably Palestinians. Thanks to a mobile phone line that was unintentionally left open, Coulibaly's dialogue with his hostages was recorded and transcribed by RTL (French radio). Coulibaly said his action was revenge for the Syrian government action and against the Western coalition actions in Mali, Iraq, and Afghanistan. The victims were posthumously awarded the Legion of Honour by the French Republic. 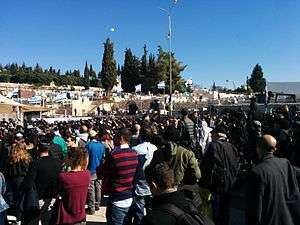 At the instigation of the Israeli government, and after some pressure on the families, it was decided that they should be buried at the Givat Shaul cemetery in Jerusalem, Israel, on 13 January 2015. The funeral was attended by thousands, some holding signs reading "Je suis juif" or "Je suis Israelien", with pictures of the four deceased. During the ceremony, Israeli Prime Minister Benjamin Netanyahu, Israeli President Reuven Rivlin, and French Ecology Minister Ségolène Royal gave brief speeches. Royal said, "Anti-Semitism has no place in France. I want to assure you of the unfailing determination of the French government to fight against all forms and acts of anti-Semitism." President François Hollande described the event as a "terrifying act of anti-Semitism." Israel's Foreign Affairs Minister Avigdor Lieberman issued a statement, saying the attacks "[were] not just against the French people or French Jews, they're against the entire free world. This is another attempt by the dark forces of radical Islam to unleash horror and terror on the West. The entire international community must stand strong and determined in the face of this terror." The Facebook page of "Al-Rasalah publication" praised the attackers. According to Arutz Sheva, the publication is linked to Hamas. Lassana Bathily, a Muslim store worker who moved from Mali to France in 2006, was hailed as a "hero", a title he himself rejected. Israeli Prime Minister Benjamin Netanyahu expressed his appreciation for Bathily's actions. Bathily was awarded French citizenship for his life-saving actions. On 20 January, 2015, at a special ceremony in Paris, he was given his passport by the French prime minister, Manuel Valls, in person; the interior minister, Bernard Cazeneuve, was also present. A petition was also started to grant him the Legion of Honour. On 24 March 2015, at a ceremony in Los Angeles, he was presented with the Medal of Valor of the Simon Wiesenthal Center. French comedian and political activist Dieudonné M'bala M'bala likened himself to Amedy Coulibaly on Facebook, commenting that "I feel like Charlie Coulibaly." As a result, he was detained and questioned by the French police. Moreover, Paris prosecutor started a legal investigation due to his alleged "defense of terrorism". The French Prime Minister, Manuel Valls, stated, "Racism, antisemitism and the defense of terrorism are crimes," adding, "One should not confuse freedom of opinion and antisemitism." Moreover, Bernard Cazeneuve, the Interior Minister, called Dieudonné's remark "contemptible." The Conseil Représentatif des Institutions juives de France (CRIF) also denounced Dieudonné's comment, and called for French theatres to block him from performing. CNN reported that United States President Barack Obama stated deep concern about "a bunch of violent, vicious zealots who behead people or randomly shoot a bunch of folks in a deli in Paris." 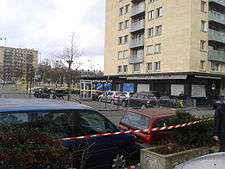 ↑ "Charlie Hebdo shooting: Amedy Coulibaly linked to attack on jogger after magazine massacre". ABC News. 11 January 2015. Retrieved 13 January 2015. ↑ Alexander, Harriet. "How did the Paris terrorists get hold of their weapons?". Telegraph. Retrieved 2016-03-13. ↑ Jane Onyanga-Omara, USA TODAY (11 January 2015). "Video shows Paris gunman pledging allegiance to Islamic State". USATODAY. ↑ "alert bibi coming". Jewish Telegraphic Agency. Retrieved 11 January 2015. ↑ "Four victims of terror attack on kosher supermarket named". ynet. ↑ "Paris shootings: Hostages killed at Jewish supermarket named". International Business Times UK. ↑ "Charlie Hebdo attack: Manhunt – live reporting". BBC News. 9 January 2015. ↑ "Paris shooting updates / Charlie Hebdo attackers take hostage after car chase". Haaretz. 9 January 2015. ↑ "DIRECT – Porte de Vincennes: plusieurs otages, au moins deux morts". MidiLibre.fr. ↑ "Le suspect de Montrouge, Amedy Coulibaly, était bien le tireur de Vincennes". Lemonde.fr. 2016-02-25. Retrieved 2016-03-13. ↑ Lichfield, John (9 January 2015). "Paris attacks: Gunman and four hostages killed at kosher grocery shop as police launch assault". The Independent. London. Retrieved 9 January 2015. ↑ "Paris Terrorist Recorded Video of Massacre at Kosher Market on GoPro Camera: Report". KTLA. ↑ Matthew Weaver. "Charlie Hebdo attack: French officials establish link between gunmen in both attacks — live". the Guardian. Retrieved 10 January 2015. ↑ "French forces kill newspaper attack suspects, hostages die in second siege". Reuters. 9 January 2015. Retrieved 10 January 2015. 1 2 "DOCUMENT RTL – Quand Coulibaly essaye de se justifier devant ses otages à l'épicerie casher". RTL.fr. ↑ Mullin, Gemma; Charlton, Corey; Allen, Peter; Wyke, Tom; Akbar, Jay; Robinson, Julian; Cook, Fidelma; Beckford, Martin (9 January 2015). "The chief rabbi's son, shop worker saving for his marriage, teacher and pensioner: Faces of kosher deli hostages killed by Jew-hating jihadist". Daily Mail. London. Retrieved 9 January 2015. ↑ "Kosher supermarket attack victims to be laid to rest in Israel". ynet news. Retrieved 11 January 2015. ↑ "Porte de Vincennes: Yohan Cohen, "mort en voulant sauver un enfant"". Yahoo France. Retrieved 11 January 2015. 1 2 "This Muslim Clerk At The Paris Kosher Store Risked His Life To Save Jewish Shoppers". The Daily Caller. 10 January 2015. 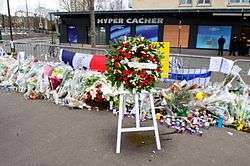 ↑ "Paris attacks: Muslim store worker Lassana Bathily hailed as hero". CBC News. 11 January 2015. ↑ Suissa, David. "Lassana Bathily: The Muslim who saved French Jews." Jewish Journal. 9 April 2015. 9 April 2015. ↑ "Paris terror sieges: hostages survived by hiding". Sydney Morning Herald. 10 January 2015. ↑ "Muslim Lassana Bathily Hailed As Kosher Market Hero, Saved Several Customers From Attack". The Inquisitr. 12 January 2015. 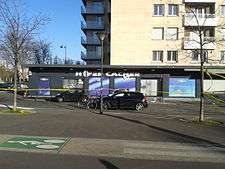 ↑ "Paris shooting: Armed man takes hostages in Paris kosher store". The Sydney Morning Herald. 9 January 2015. Retrieved 9 January 2015. 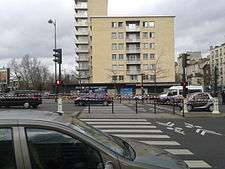 ↑ "Hostages Seized at Kosher Supermarket in Porte de Vincennes: Paris Cops". NBC News. 9 January 2015. Retrieved 10 January 2015. ↑ Prince, Sam (2015-01-09). "Amedy Coulibaly Dead: 5 Fast Facts You Need to Know". Heavy.com. Retrieved 2016-03-13. 1 2 ABC News. "Paris Terror Attack: 4 Hostages Killed Before Police Staged Final Assault". ABC News. Retrieved 11 January 2015. ↑ "Paris hostage situation ends with gunman dead". CBS News. 9 January 2015. Retrieved 9 January 2015. ↑ "Who Is Amedy Coulibaly? Paris Kosher Deli Gunman Once Worked For Coca-Cola, Was Close With Kouachi Brothers". International Business Times. 9 January 2015. ↑ "Quatre otages tués à Paris dans une supérette casher". Libération. 9 January 2015. ↑ Yamiche Alcindor; Jabeen Bhatti (2015-01-10). "Supermarket employee hid customers during Paris attack". Usatoday.com. Retrieved 2016-03-13. ↑ "Israel pressured Paris attack victim's family to bury him in Israel". Haaretz.com. 14 January 2015. ↑ Alderman, Liz (10 January 2015). "After Terrorist Attacks, Many French Muslims Wonder: What Now?". The New York Times. ↑ "Gunman 'Neutralized' At Kosher Supermarket Siege". Newsweek. 9 January 2015. Retrieved 9 January 2015. ↑ Dearden, Lizzie (10 January 2015). "Paris attacks: Hamas condemns Charlie Hebdo massacre after Netanyahu makes comparison to Gaza rockets". The Independent. London. ↑ "Hamas-Linked Publication Praises 'Heroic' Paris Terrorists". Israel National News. 10 January 2015. ↑ Noah Rayman (15 January 2015). "Lassana Bathily to Get French Citizenship for Aiding Jewish Hostages". TIME.com. ↑ "Demande de naturalisation de Lassana Bathily". Ministère de l'Intérieur (French government). ↑ "Lassana Bathily honored in Los Angeles". Consulate-General of France in Los Angeles. 25 March 2015. Retrieved 15 November 2015. ↑ Adam Chandler (12 January 2015). "France's First Free-Speech Challenge After Charlie Hebdo". The Atlantic. ↑ "«Le racisme, l'antisémitisme et l'apologie du terrorisme sont des délits» déclare Manuel Valls | Crif - Conseil Représentatif des Institutions Juives de France". Crif.org (in French). Retrieved 2016-03-13. ↑ "Obama 'hopeful' about partisanship, race relations". CNN. ↑ "Part two: Foreign policy – Barack Obama: The Vox Conversation". Vox. Retrieved 14 September 2015. ↑ "Paris kosher supermarket reopens after deadly hostage crisis". France 24. 15 March 2015.